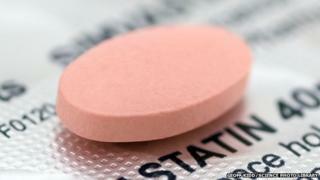 Proposals to extend the use of statin drugs should be scrapped, a group of leading doctors and academics says. The National Institute for Health and Care Excellence published draft guidance in February calling for their use to be extended to save more lives. It could mean another five million people in England and Wales using them on top of seven million who already do. But in a letter to NICE and ministers, the experts expressed concern about the medicalisation of healthy people. The letter said the draft advice was overly reliant on industry-sponsored trials, which "grossly underestimate adverse effects". And it added: "The benefits in a low-risk population do not justify putting approximately five million more people on drugs that will then have to be taken lifelong." Media captionMark Baker, NICE: Statin side effects "taken into account"
The drugs reduce levels of cholesterol in the blood, lowering the risk of a heart attack or stroke. The signatories include Royal College of Physicians president Sir Richard Thompson and former Royal College of GPs chairwoman Clare Gerada as well as cardiologists and leading academics. Prof Simon Capewell, an expert in clinical epidemiology at Liverpool University and one of the signatories, said: "The recent statin recommendations are deeply worrying, effectively condemning all middle-aged adults to lifelong medications of questionable value. "They steal huge funds from a cash-strapped NHS and they steal attention from the major responsibilities that government and food industry have to promote healthier life choices for ourselves and our children." But the draft guidance suggested that people with as low as a 10% risk should be offered the treatment. Too much cholesterol in the blood can lead to these fatty deposits. Statin drugs work by lowering cholesterol. Like all medicines, statins have potential side-effects. They have been linked to muscle, liver and kidney problems, but just how common these are is a contentious issue. One of the signatories to the letter is London cardiologist Dr Aseem Malhotra, who last month had to withdraw claims he made in a British Medical Journal article that a fifth of people who use statins experience side-effects. "I was prescribed Simvastatin about nine years ago following heart problems," says John Cakebread, from Kent. "I stopped taking the medication six years later after researching the subject on the internet and finding out about side effects. "I have now been left with peripheral neuropathy in the feet. "My GP refuses to acknowledge this condition and that it could be caused by statins. "He still wants me to take this medication, but I have refused." Mike Knapton, of the British Heart Foundation, said NICE was right to want to extend the use of statins. "Evidence shows that statins are a safe, effective, cholesterol-lowering drug and proven to lower the risk of heart disease." He added that, if anything, NICE should go further by looking at the lifetime risk rather than 10-year timeframe being proposed. NICE has consulted on its draft proposals and is expected to publish final guidance at the end of July. Prof Mark Baker, from NICE, said as well as the consultation the recommendations are being peer-reviewed. He also pointed out that the guidance did not say patients had to go on these drugs - as GPs and patients can also discuss lifestyle changes to reduce risk - but just gave them the option of using them. "This guidance does not medicalise millions of healthy people. On the contrary, it will help prevent many from becoming ill and dying prematurely," he added.